A military compound, a training camp and a weapons storage facility, belonging to Gaza’s rulers, are among the areas targeted by the IDF in extensive overnight strikes after a rocket fired from the strip landed in the Eshkol Regional Council on Wednesday night; no damage or injuries reported. 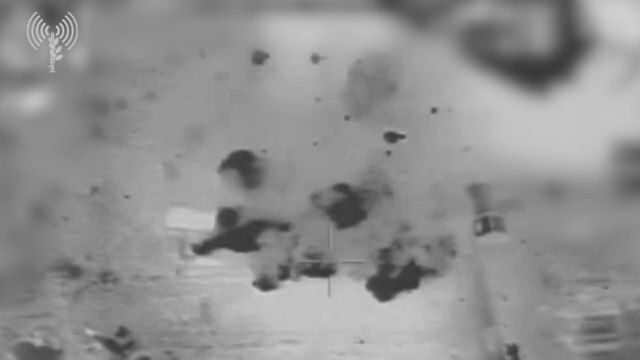 Israeli Air Force (IAF) aircrafts attacked overnight Thursday eight Hamas sites in Gaza in response to a rocket fired from the strip, which landed in the Eshkol Regional Council. The rocket alert siren went off at 23:17 on Wednesday in the Eshkol Regional Council, and according to the IDF, an Iron Dome interceptor missile attempted to down the rocket but failed. The rocket exploded in an open area and no damage or casualties had been reported. A Code Red siren also blared in Merhavim Regional Council, but no missiles are reported to have hit the area. Hamas did not officially claim responsibility for the rocket attack. However, the IDF blamed Gaza’s rulers for the incident. “The Hamas terror organization is responsible for everything that is happening in the Gaza Strip, and it will bear the consequences for the terror activity aimed against Israeli citizens. “The IDF is prepared for a variety of scenarios and is determined to continue its mission to protect the citizens of Israel,” the statement concluded. On Wednesday afternoon, an IAF plane attacked a Hamas observation post east of Rafah in the Gaza Strip, in response to incendiary balloons being launched into Israeli territory in the outpost’s proximity. In addition, two Palestinians breached the border with Israel. They retreated back to the strip shortly after. IDF forces searched the area, and ruled out infiltrations into Israel. Nine fires sparked throughout the day across the Gaza border communities as a result of incendiary balloons flown from Gaza. This entry was posted on October 25, 2018 at 5:10 PM and is filed under Uncategorized. You can subscribe via RSS 2.0 feed to this post's comments. You can skip to the end and leave a response. Pinging is currently not allowed. How many “military ” compound and training centers are there in Gaza? And how many has Israel destroyed the last year ? Is Gaza as whole a ” military ” compound ? How many terrorists are killed with the last attack ? Just a few simple questions . Are there simple answers ? I suspect that my last question is not so simple . Ps: Lieberman more fuel is needed special from Qatar . And the waiting is for the ultimate peace plan !